In 2016, NROC's marketing leadership identified "Networked for Change" as the theme of their upcoming 2017 annual member meeting. Blue Marble was tasked with developing a visual identity for the theme. The team at NROC felt inspired by aspen trees and wanted to use an aspen forest as a metaphor to describe how being "networked" is a powerful force for change. We agreed that the idea was a great fit for this collaborative group of education leaders. The branding program would need to appeal both to young teachers and seasoned administrative leaders. "Networked for Change emphasizes how natural and human systems of connection encourage resilience and evolution. The NROC Network of members is a powerful force for change, unified by a commitment to honor and support all learners." For the campaign visuals, we created an illustration of an aspen forest spreading across a landscape with connected roots underground. In addition to creating the illustration, we developed the overall visual identity, including the Networked for Change logo and a style guide with defined colors, fonts, and graphic elements. 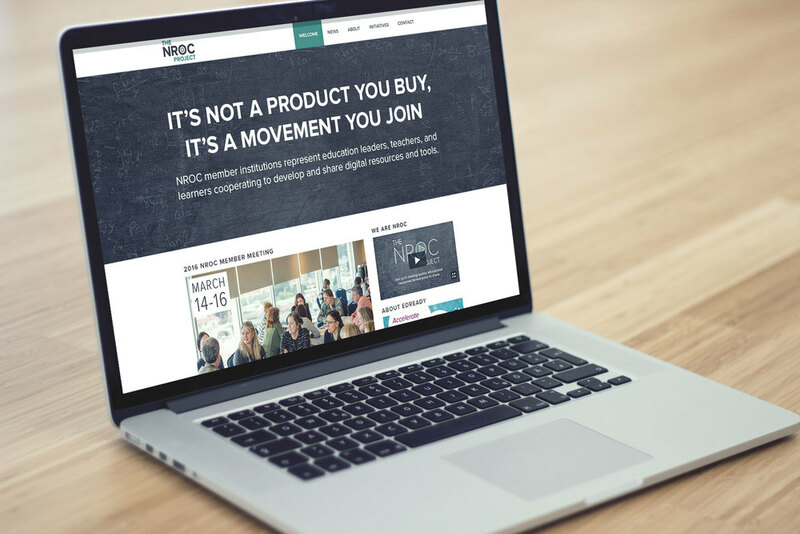 Working closely with the NROC marketing team, the theme was integrated into conference activities. 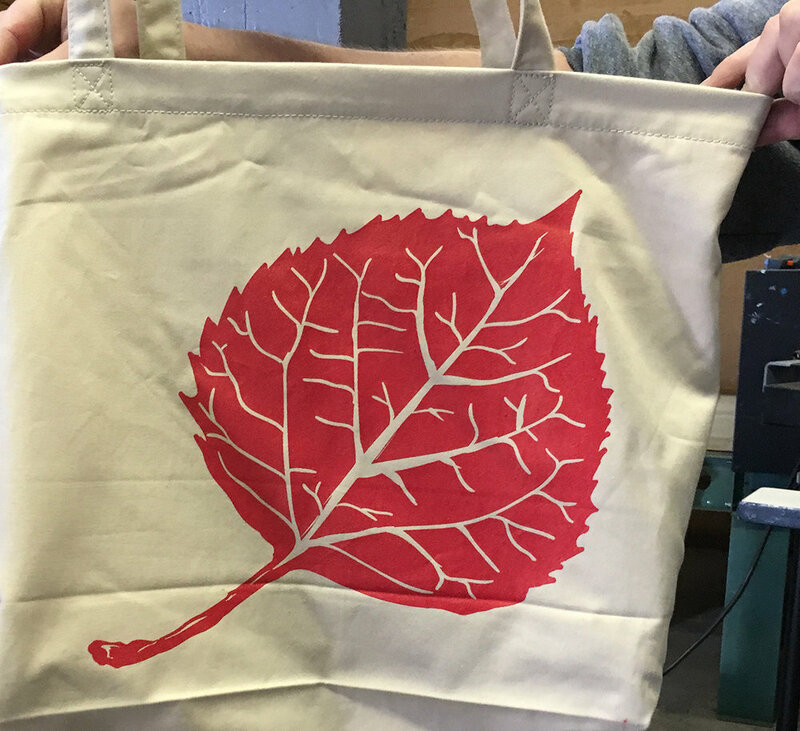 The visual identity was applied across a range of media, including signage, name tags, agenda, tote bags, notebooks, a card deck, slide presentations, websites, emails, conference app, and more. The Networked for Change branding succeeded in capturing the mood of this nonprofit project as its membership works behind-the-scenes to re-think pathways to student success and improve outcomes within the U.S. education system. 2017 Ambassador award winner and California Adult Education professional, Penny Pearson proudly displays her award featuring the Networked for Change aspen illustration. Koru began as an immersive, in-person business-training program for recent college grads, guided by a new paradigm for what it takes to succeed in today's job market. When Koru first approached Blue Marble in late 2014, the company was preparing to build an online component to reach a greater number of job-seekers and provide additional value to employers. Blue Marble participated in design of this new, tech-based offering at various points from early concept through development. As experts in job success for some of the world's top companies, Koru's leadership team holds themselves and others to a high standard. This team really understands the design process and is constantly looking to innovate, so no idea is too precious to be challenged and the customer's need is held in the highest regard. Every aspect of every project was a collaboration with many other bright and talented people. During our first engagement, Koru's leadership described their vision and we worked together to assemble their ideas into early prototypes and mockups which were used for fundraising and customer research. When a team was assembled to develop this new element of the business into a full-scale online application, Blue Marble worked with Koru's core team to support design for the consumer-facing application and to develop companion offerings to employers and colleges. We also helped to design an administrative interface for Koru staff to manage the day-to-day operation of the system. Koru is transforming the way companies screen, hire, and develop early-career millennial talent through their data-driven talent analytics solution. They work with Fortune 500 brands and high-growth companies across dozens of industries to find and develop the right fit talent to meet their needs. While much of Blue Marble's work with Koru was proprietary and confidential, you can see below a few examples of the types of projects we were engaged with. In early stages, Blue Marble met with Koru to gather notes and sketches, then developed mockups to represent Koru's vision for the product for both employers and job-seekers. These were sufficiently detailed to facilitate conversation with prospective funders and to raise questions for customer research, allowing the product idea to develop and evolve to meet market needs. Customer journey maps for both job-seekers and employers: internal documents like these are helpful to encourage focus and clear understanding of customer needs. Koru provided customer research, BMC handled visual design/layout. Administrative portal screen: how an employee of Koru would evaluate and give feedback on a video submitted by an applicant. We designed dozens of screens to be used as part of the day-to-day operations of Koru. From middle school to college, students across the U.S. are using EdReady to fill their knowledge gaps and surpass their own expectations. When NROC's founder, Gary Lopez, first told us about his vision for EdReady in 2012, NROC had recently secured funding from the Bill & Melinda Gates Foundation to build EdReady. The big goal for EdReady was to help vastly more Americans complete college. EdReady would be a free online tool with a more advanced and customized version used in educational institutions nationwide. The app would allow students to self-assess for math and English readiness and then follow a personalized study path to fill in their knowledge gaps. EdReady needed to appeal to a broad spectrum of people. Imagine a student headed to a rigorous college STEM program, or an adult with math anxiety striving to earn a G.E.D. A project like this requires the involvement of many stakeholders. Blue Marble was engaged to handle design for EdReady, both UX design and the brand identity and marketing materials. Christine Fisher and John Watson of Evergreen Education Group discuss EdReady with high school students during a day of user testing. NROC is unique in that their work is guided by a national network of educational institutions. Therefore, the need to get buy-in from students, schools, and other education leaders is embedded into its business model. Blue Marble helped with focus groups to test our assumptions and gain valuable insight into the user’s experience with early prototypes. Within the first three months, the interface underwent three major revisions based on feedback from students and teachers. We observed a wide spectrum of attitudes about math and college, learning our target audience's own language so we could gain their trust and engagement. EdReady is currently being used by institutions across the U.S. including some entire state systems such as Montana, Hawaii, Utah, Idaho, Nebraska, Tennessee, North Carolina, and others. A short documentary (about Montana) is available to show what a statewide implementation of EdReady looked like in 2015. Blue Marble was involved in the production of this film, conducting the interviews and providing feedback during the editing process. EdReady has matured from the concept stage to become a fully functional product with a coherent brand and story that continues to unfold. Based, in part, on the value EdReady brings to educational institutions, NROC has been able to increase membership and is working toward becoming a self-sustaining project. Blue Marble produced this first explainer video in 2014, including script, storyboards, illustration, voiceover, motion and sound design. Due to our careful planning the video serves a variety of needs and has been customized for multiple states and school systems. In 2015 we produced a six-part online toolkit for education leaders to promote EdReady within their own institutions. A variety of customizable materials and a complete style guide were included. The toolkit was also shared as a credit-card-sized flash drive in conference bags. Our work has included designs for conference signage, name tags, and collateral. A suite of reports allows administrators and teachers to support students using EdReady. How is Ms. Sandoval's Algebra 1 class performing? How has Elizabeth been spending her time inside EdReady? How did Jonathan reach his target score so quickly? Blue Marble helped NROC to create a system that answers questions like these based on research into the needs of EdReady's administrative users. The "study path" where a student can learn about topics they need to study, then check their knowledge to improve their scores. Students can learn and assess themselves at their own pace in a low-stakes environment with constant feedback. Hundreds of education leaders have contributed time and expertise to this project and the underlying learning resources. It is truly a labor of love for many. To learn more about the organization behind EdReady, and to hear what education leaders are saying about EdReady, see the above video. You can also learn more about our work on The NROC Project. Inter-Fluve is an interdisciplinary firm specializing in investigations, design, and restoration of rivers, lakes, and wetlands. As pioneers in their field, they develop solutions to complex aquatic challenges while balancing human and environmental needs. With over 1,600 successful projects across 4 continents and all regions of the United States, Inter-Fluve is challenged to communicate the depth and breadth of their excellent work. The firm had recently launched a new website when they contacted Blue Marble to help with a variety of printed materials. The website project established a new direction for the brand identity with prolific use of real project photos and friendly staff bios. Our challenge was to provide a more precisely defined set of graphic styles and template documents for ongoing use by internal staff. Inter-Fluve was facing a common challenge, where many staff members were tasked with creating printed materials with limited time, changing needs, and varied levels of skill and interest in the task. While we couldn’t change alleviate the hard work of in-house publication and design, we were confident we could provide a pool of template resources considered specifically for the needs of Inter-Fluve staff. First, we worked with marketing staff to identify the needs and limitations. We also came on site and met with engineers and other non-marketing personnel to understand their perspective on the brand and their involvement in the publication process. And, we conducted our own visual research to understand their language and culture and how the brand had evolved. In our initial conversations, Inter-Fluve’s marketing staff shared the desire to develop something classy, elegant, consistent, and personable. We worked together to identify open-source fonts that look good so that multiple staff could easily collaborate on these documents, and we trained the staff on how to use Adobe InDesign for the trickier elements of our designs. We also helped them to set expectations internally for how photography is is a critical investment, and that no template can replace thoughtful design work. Over the years since the work was completed, Inter-Fluve has continued to use the templates we developed. Thanks to their commitments to shooting quality photos, learning the ropes with design programs, and staying true to the templates we developed together—they now have a strong arsenal of resumes and project summaries to pull from for each new project proposal. The results include greater efficiency with sales and outreach efforts, positive impressions on prospective clients, and increased confidence and pride amongst staff. “Clients and employees have been impressed with our materials. It’s worked well to have solid templates that look great and keep our deliverables looking consistent. Sometimes there’s no substitution for having good design sense and being able to create a document for a unique situation. I’ve been working on improving my design abilities but I also recognize there’s a time to bring in the pros when a template doesn’t cut it. Overall, the investment was very worthwhile. BMC did a great job in completing what we asked of you. The templates are elegant yet simple; they make the company look good. Just as important, I think they make employees feel proud of the product they are creating. Maslow Project has worked hard to establish a network of programs and support to address the physical, mental, emotional and aspirational needs of Jackson County’s homeless youth and their families. When they contacted Blue Marble, Maslow already had tremendous impact in the community and was highly regarded as an agency of integrity in advocating for its clients. Although Maslow Project had already gained some national (and even international) attention for its innovative model, they struggled to allocate the necessary resources to build and maintain a cohesive brand identity. Unfortunately, this led to confusion with other human services organizations in the community. When a donor asked where Maslow needed the most support, the leadership spoke up about the need for help with branding. The donor suggested (and generously funded) Blue Marble to develop a communication strategy to take Maslow's communications to the next level. Our work with Maslow commenced with a BluePrinting phase during which we met with Maslow's leadership team to gain an understanding of the operation, its various audiences and specific issues we needed to address. From there we developed a messaging strategy and recommendations for updating and expanding the brand identity. We took a two-pronged approach, developing one communication piece aimed at homeless youth and families, and another aimed at donors. The two audiences are both critically important, and in the process of developing these different items we gained a lot of clarity about the different needs and perspectives of each. Maslow’s clients are young people, so protecting their privacy and respecting their dignity is paramount. As such Maslow had long ago decided against using images of their clients’ faces or other identifying features in any marketing or outreach material. We wholeheartedly agreed and took this into account when considering concepts for imagery. We all agreed that Maslow’s successful art therapy program would be a wonderful resource for inspiration. The blue triangle in the Maslow logo is a powerful symbol that we retained and emphasized. The meaning of the triangle conveys many things besides the literal reference to Abraham Maslow’s hierarchy of needs. We were reminded of the gable of a roof, a tent, raising up, strength, and stability. Inspired by a client artwork that depicted hands together in the shape of a triangle, we recommended that the Maslow team start using this hand gesture in real life as a physical symbol denoting “Maslow." When the hands are together formed into the triangle, they also convey the idea of embracing, encircling—Maslow’s wrap-around support. It was also important to keep in mind that homelessness often goes unnoticed because it's not what people may assume. We were careful not to use any imagery that depicted dirty, downtrodden persons hanging on street corners or in back alleys. By contrast, we show uplifting images based on what Maslow offers its clients and their families and portray the outcomes that Maslow kids experience. Maslow’s youth-centric agency model and its ability to meet kids where they are makes it unique from other agencies serving similar populations so it was important to visually play this up. No other entity in Jackson County and few others nationwide have been able to develop the range of programs and blend of school- and community-based services that Maslow offers its clients. A graphical depiction of Maslow’s approach brings the concept to life. Now Maslow has a consistent, tangible way to describe how it works and to reference the many services it encompasses. Maslow is able to differentiate from other organizations and establish its unique value proposition. Staff report a greater confidence and clarity when talking to others about what Maslow does. The team now has key collateral pieces like brochures and an array of visual assets, and they have been able to use to create other material in-house. Incidents of gun violence have broken our collective and individual hearts time and again. In the United States, each incident incites a polarizing, often judgmental debate. Aside from (hopefully) holding our loved ones a bit closer, many of us are left wondering what we can do about such a deeply emotional and complex issue. In September 2015, a group from Southern Oregon contacted us with a unique perspective. Vision Quilt is asking people to envision a future without gun violence. They host creative workshops to help people express themselves, and they're collecting 18 x 24-inch works of art from participants. They piqued our interest when they told us they were recruiting people of all ages and backgrounds, including gun owners. We were impressed by the commitment they showed to embracing all voices and promoting the simple idea that change is possible. They were inspired by the AIDS quilt, and they're aspiring to reach a similar scale. Founder Cathy DeForest says, “This will become a major national movement shown in monuments and houses of worship around the country.” She pictures the quilts displayed at the Washington Monument one day. The core committee was developing a campaign theme when Cathy reached out to Blue Marble for help. As seasoned professionals and artists they were not short on great ideas. They needed an outside authority to help them discern and develop their best concepts. At this point they had 20-30 panels, a few photos, and the beginnings of a website. They were eager to reach out to influential contacts and prospective partner organizations, but first they needed to be sure their message was clear, and that they would be taken seriously. We started with a review of the language Vision Quilt was considering. We watched videos and articles they shared to describe their views and motivations, and we discussed these ideas over a number of conference calls. When addressing a contentious issue like this it's important to for us to pay attention to many sources of commentary to build empathy for the audiences our client wants to reach. We refined the existing language with the goals of being clear, concise, engaging and nonpartisan. The writing was a collaborative process with a lot of testing on outsiders. When everyone agreed, we pared the language down one last time, suggesting an appropriate hierarchy for presentation on their website. To visually represent the project, we advocated for a text-only logo, and for developing an adaptable visual language around that. It is common for people to want a logo that says everything, but of course that's challenging to pull off. In this case, the quilt panels themselves speak volumes—beautiful, poignant, politically charged, and with a wide range of visual styles. There was an important balance to be struck here between letting the panels be seen, and offering an inspiring but neutral focal point to welcome new participants. We collected sketches and ideas from the group before providing a recommendation. One of our insights was to steer clear of quilt imagery. Stitching, warm fabric, and pieces coming together all seemed like nice metaphors, but we found these quilt ideas most compelling when described verbally. Graphically, we needed to counteract the image of a traditional quilt to convey the inclusiveness and scale of this work. One team member showed us a quilt she made when she was sixteen in the shape of the United States. Another was drawn to bright, hopeful colors, and provided some examples using watercolor. We merged these ideas to come up with the watercolor map imagery. The custom, handwritten logo is intended to convey the grassroots and emotional nature of the project. The map image delivers the main idea—a national art project. We provided alternate imagery for use on business cards and event banners of hands coming together with different artistic media, showing how the watercolor look could be extended to other symbolism. Time will tell how to best evolve this brand and we look forward to continued collaborations. The new language and visuals were added to the website just in time for high-profile meetings and introductions. The client reports that the professionalism of their materials has helped to inspire confidence from partner organizations at the national and local levels. A variety of assets have allowed Vision Quilt to continue growing and building out their communications on a shoestring. People ages 4 through 92 have contributed to the project. Keeping Pace with K-12 Digital Learning is an annual report that examines the status of K-12 online education across the United States. Schools, districts, nonprofits, government, and companies rely on the Keeping Pace annual report and website to pinpoint key challenges and see overarching trends. With so much information to convey, Evergreen Education Group has worked with Blue Marble over the past seven years to enhance the visual presentation of this annual report. Every year we make incremental improvements to make this important body of research more accessible to diverse audiences. Knowing that the visual presentation of the data in the Keeping Pace report is nearly as important as the data itself, Blue Marble has taken part in numerous discussions with Keeping Pace authors. We introduced new design concepts for maps, charts, and tables to make the information easier to digest and share — in print and digital formats. Developing these visual tools requires a high level of collaboration between Blue Marble and the report’s authors and stakeholders. In addition, with so many rapid changes happening in the field of online and blended learning, the Keeping Pace printed report quickly becomes dated. A website with a customized content management system and integrated blog allows Evergreen staff to easily disseminate their research, keep information up to date, and share their expertise throughout the year. Evergreen Education Group has redefined the way information is conveyed in K-12 online and blended learning. Infographics are now an anchor of the Keeping Pace annual report and website, and are used in presentations, classes and more. Interactive maps on the Keeping Pace website feature up-to-date information. Reports and infographics are available for free download and easy sharing. A fully integrated blog has given Evergreen staff a platform on which to build their thought leadership, expand their reach and allow experts to share relevant news and resources on an ongoing basis. For many years, we've worked with the Keeping Pace research team to distill the key findings and transform them into compelling stories. Whether the stories are told through graphics, case studies, or other narrative styles, Blue Marble helps ensure that Keeping Pace delivers rich, compelling content that’s freely available in both print and digital channels. In 2015 the authors of Keeping Pace decided to shift the focus completely from text to data visualization. We created a significantly greater number of infographics and adjusted the layout to bring in more white space. The result is a visually compelling presentation of data-rich information throughout the whole of the 2015 report; a change that has been positively received by audiences. The NROC Project (NROC) is a national nonprofit that gives education leaders, teachers, and learners a voice in the production of digital content and software. Originally known as a “national repository of online courses,” the organization has received support from the Bill & Melinda Gates Foundation, the William and Flora Hewlett Foundation, and others to build award-winning online learning tools. NROC is especially unique because they receive membership fees from educational institutions. Membership institutions share in both the work and the rewards of these development efforts. In this way, institutions are able to guide the development of learning materials to their own high quality standards while gaining access to excellent resources at a fraction of the typical cost. When Blue Marble first started working with NROC in 2008, the organization was comprised of several passionate staff with deep roots in education and technology. They had created various projects and initiatives lacking one recognizable name. The group was successful at securing grant funding and delivering quality work, yet it was difficult to gain recognition in a crowded and competitive marketplace. We were tasked with helping to narrow their approach and to define a brand architecture that could be used consistently long-term. Over its 10-year history, NROC had proven to be much more than a static, “online repository.” Its unique attribute was its truly active community of education leaders. We began our work with a research and discovery phase, where we gained an understanding of the founder's longer-term vision. With that perspective, we suggested modifications to streamline the language for the organization’s projects. While many of these projects were complex, we realized the need for clear, concise names and consistent themes to address a diverse, national audience. This has been a multi-year process, and we are proud to say that due to the persistence and determination of everyone involved, NROC is increasingly gaining recognition for their valuable and innovative work. NROC began referring to itself as "The NROC Project" to change the focus to the active and participatory nature of the work while retaining their history. The visual identity has become more modern and professional, with an evolving suite of print and digital collateral to clearly articulate the mission, values, and offering. Various elements of NROC's customer/member experience are now better aligned with the overall organization's identity. NROC has a style guide and templates that staff can use to unify ongoing communications. NROC hired a dedicated marketing director, who brought decades of experience in corporate marketing and collaborated closely with Blue Marble to grow an integrated in-house marketing department. With the goal of increasing trade in tourism services and easing the movement of travelers across their borders, partner countries of the Kavango Zambezi Transfrontier Conservation Area (KAZA) were in the process of transitioning their individual visa programs into a single unified visa system called KAZA VISA. This was to be the prototype for a wider unified visa program among the partner countries of the Southern African Development Community. As part of an awareness campaign that was launching at the United Nations World Tourism Organization 2013 Assembly, The World Bank hired Blue Marble to develop a brand identity and communication materials that would garner support and leverage growing enthusiasm for the KAZA VISA program. The primary draw for most of the KAZA partner countries is their abundant and unique flora and fauna. As such we focused on how to use wildlife as a central theme and also convey the idea of borderless travel. We settled on a white bird in flight as the graphic for the primary logo. In certain formats, this logo was expanded to include an illustrated depiction of the Victoria Falls Bridge connecting Zambia and Zimbabwe which, with Zambia and Zimbabwe as the two pilot countries for the KAZA VISA, was symbolic of their close partnership. We created a small booklet to provide detailed information about the KAZA VISA program as well as profile the KAZA partner countries. As KAZA VISA is ultimately a promotion for travel within and among the KAZA partner countries, we formatted the booklet to have a similar feel as a passport. It was important to incorporate beautiful imagery of landscape and wildlife and although the KAZA team lacked access to high quality photos, we were able to secure many compelling images from our own image library. We also designed business stationery, a rack card and large stand-up banner for The World Bank and KAZA teams for use at various events and for branded correspondence with current and prospective program participants and backers. The brand identity enabled The World Bank and KAZA teams to more successfully educate and generate support for the program. The communication materials have helped to encourage regional collaboration between KAZA partner countries and in particular to build awareness of Zimbabwe and Zambia as competitive international tourism destinations for cross-border tourism activities. Several years ago the State Education Technology Directors Association (SETDA) developed an online database called the State Education Policy Center which housed data related to state policies on broadband access, online assessments and professional learning. Both the website’s public user and administrative interfaces were clunky and hard to negotiate such that it was difficult for SETDA staff to keep the site up-to-date with current information. With a large amount of new policy information recently gathered and more on the way, SETDA asked Blue Marble to create a new website that would make the data more accessible and easier to manage. The most significant aspect of the project was the data that resulted from a survey SETDA had issued to all 50 states and two US territories. It was a huge amount of information concerning the procurement of digital instructional materials that is constantly changing. The data needed to be housed in such a way that users could understand the big picture as well as pull out detailed data points as needed. Both SETDA and BMC teams worked hard to comb through and organize this data into a computer-readable format. Because SETDA intends to add additional topics to the site, it was also important to develop an information architecture that would would allow the site to expand and layer multiple data sets. A central component of the new website is a data-driven interactive map that helps users easily see what’s happening across the nation with various topics related to digital instructional materials. From this map users can access a detailed profile of their particular state. A comparative table enables users to select up to five states to run a side-by-side analysis and ultimately understand the policies, requirements, and process for online content procurement as it relates to their particular situation. State and district leaders better understand policies related to procuring instructional materials in order to best meet student needs and potentially impact policy changes. With this information, publishers, technology developers, and funders know which states are open to innovations and understand individual states’ processes for acquiring digital instructional material. State profiles and data sets can easily be shared, exported or printed. SETDA staff have been able to easily adjust data points within the website’s CMS. When Dave Martin, owner and practitioner at Trinity Natural Medicine (TNM) and the White Salmon Apothecary (WSA), was first getting established, he recognized he needed help with several key aspects of launching a new business. In addition to seeing patients in his Chinese medicine practice, Martin was planning to carry and sell a wide selection of Chinese herbs to fill custom prescriptions for his clients and other practioners. Martin originally went to Blue Marble because he wanted help in producing his basic vision for a logo. What he didn't realize was how much BMC would be able to help him via our BluePrinting process to clarify and document many aspects of how his business would work. While Martin was clear about why he wanted to practice Chinese medicine, he was uncertain about how to position his business and the steps to get started with communications. We were able to help him define clear, actionable items related to his marketing and communication efforts. Martin's unique approach to healing includes conducting a broad spectrum review of a client’s condition in the context of both Eastern and Western medicine. After defining short and long-term objectives, audience profiles, and key messages, we developed two separate but related brand identities, one for the clinic, and one for the apothecary. Martin wanted to grow the clinic and the apothecary at their own natural paces, and Blue Marble helped him acquire the communication tools to do this. Through BluePrinting, Martin was able to refine his business strategy and establish the relationship between the clinic and the apothecary. With professionally designed materials, website and well-thought out content, TNM and WSA quickly established credibility and trust so Martin could build a successful practice. Being in the clinic is a sensory experience. A library of high quality image assets helps to show future patients and customers how it is to be treated in this environment, surrounded by rare Chinese herbs and Martin’s fine carpentry work. Martin’s mother happens to be a professional illustrator. Her illustrations are paired with old-fashioned type to create a meaningful logo for the apothecary. Branded client in-take forms, labels, and packaging for the herbal prescriptions from the apothecary ensure a complete and pleasant customer experience. This level of attention to detail is further demonstration of how TNM treats its clients. Shortly after opening his clinic, TNM moved into a larger building and Martin hired staff. He has been able to build upon the brand identities we created. Backed by Oregon State University (OSU) Extension Service, the Wasco County Network on Aging is a consortium of local agencies focused on exploring ways to improve the health and well being of older adults living in Wasco County, Oregon. The organization offers monthly educational events for seniors who want to learn ways to improve their health and happiness. With a desire to increase participation in these events, OSU approached Blue Marble for assistance. Blue Marble worked with OSU and Network staff to develop a campaign name, “Passport to Happiness,” and a brand identity that is light-hearted and energetic in tone. A key deliverable was a wall calendar that features healthy food recipes, tips on personal well-being, agency resources and a full schedule of events. We created large, custom illustrations and typography that would appeal to seniors and we incorporated professionally shot images of local residents involved in relevant activities. To encourage attendance at specific campaign-related events, we designed a passport card that participants could bring to events, have stamped, and then turn in for the chance to win prizes. Custom illustration, typography and photography give the campaign materials a decidedly unique aesthetic that has resonated with participating seniors. The inaugural year of the Passport to Happiness program was so successful, the Network decided to extend into a second year. The Passport to Happiness materials has increased awareness of resources and services for older adults living in Wasco County and made learning about health and wellbeing topics more interesting and fun. With a successful first year underway, the Network decided to continue the Passport to Happiness campaign and hired Blue Marble to create a new calendar for the second year of the campaign. While the new calendar featured fresh photography and content, we maintained its overall visual identity order to build upon the project’s growing visibility and strengthen brand awareness. The last time stakeholders in the development and maintenance of the Florida National Scenic Trail sat together to discuss goals was 1986 when collaborators created the original Comprehensive Plan. Priorities and personalities shifted in the ensuing years until it became clear it was necessary to bring together land holders, trail managers and local conservation groups in order establish new priorities and create a strategy for the near-term evolution of the Trail. Conservation Impact facilitated the convening of stakeholders and managed the creation of a new 5-year strategic plan for the Florida National Scenic Trail. The strategic plan is a landmark document that provides a framework for focused, collaborative efforts and allocates resources to achieve specific results that benefit both the trail and trail user. The plan also presents a new partnership model that fully engages a diverse group of land managers who are connected to the trail. In order to bring the concepts presented to life and ensure the information would be read, the project team hired Blue Marble to come up with a thoughtful design for its layout. To appeal to a wide variety of constituents, the strategic plan needed to look less like a government white paper and more like a feature in an issue of National Geographic. To that end, we emphasized beautiful photography and lots of white space to evoke the ambience of the trail as it traverses the Florida coast and inland the expanse of its open spaces. We also incorporated a variety of staff and trail-user photos which gives readers a sense of personal connection and ownership. The publication's landscape orientation connects with the impressive length of the trail but more importantly maximizes optimal readability on screen. As a printed brochure, the Florida National Scenic Trail Strategic Plan makes the work that has been done tangible for stakeholders. Digital versions of the plan have been widely distributed making it easy to share pertinent information among the partner entities and keep the public engaged. Elements of the brochure have since been used as visual references when providing progress updates. The Hood River Soil & Water Conservation District (HRSWCD) provides technical, educational and financial support to the local community for the preservation and conservation of natural resources. Over its fifty-plus years of existence, the organization has done a great job of evolving to remain relevant. Unlike many conservation districts, HRSWCD had invested time and attention building a web presence. However, while the information on its existing site was vast, it was not well organized and its maintenance was extremely cumbersome. There was no recognizable brand identity or consistency in presentation. The liberal use of dated clip art was distracting and detracting. When HRSWCD asked Blue Marble to redesign the website, we knew we could dramatically improve their efforts to reach more people with information and services. It was a great opportunity to demonstrate how clean design can support a cleaner world. The new website would need a significant design update and restructuring in order to present information clearly so more people could understand what HRSWCD does and take advantage of its services. We quickly cleaned up their logo and overall style to provide a consistent, professional experience and reinforce HRSWCD’s perception as a credible and effective environmental steward. HRSWCD had attractive photos of flora and fauna, so we built a system to allow these images to be featured throughout the site. The site includes an interactive open community section called “Wildlife Watch” where anyone is able to post descriptions and photos of local wildlife sightings. News and events listings, an important area of activity for HRSWCD, are cross referenced throughout the sight with the ability to filter listings for a refined view. We built the website with a content management system specifically customized for the needs of HRSWCD. The CMS features a range of custom editing modules that allow staff to easily collect and manage the information for various types of resources, projects, and inventory for their annual plant sale. A user-friendly CMS is a critical aspect of the site redesign because staff had found maintaining their previous site challenging to the point of frustration and abandonment. With a quality user experience and greater ease of information dissemination, HRSWCD staff feel confident in their outreach efforts. The site acts as a central hub for HRSWCD’s related entities, the National Resource Conservation Service and the Hood River Watershed Group, so that community members understand all of the services available to them through one office. Staff are able to manage the online component of their annual plant sale more effectively. With a completely redesigned wildlife log, user engagement has increased. Staff are able to readily approve and publish user submissions from with the admin interface. HRSWCD has remained largely self-sufficient with the administration of its website content which is exactly how we intended it to be. After two years of intensive research and data compilation, the World Bank’s Africa Region Finance and Private Sector Development Unit had devised a strategy for tourism development in Sub-Sahara Africa in an effort to: formalize its involvement in tourism in Africa, create a framework for future interventions, and prioritize tourism-related activities. To garner support and funding from the World Bank’s key internal and external stakeholders, the research team needed to succinctly explain their findings and recommendations in a format easily accessible to The World Bank’s Africa-based staff and partners. Through a series of work sessions with the research team, Blue Marble helped to identify the project’s key messages and explored various ways to present them. After several iterations of data visualizations and story sequencing, we developed a shared understanding of the story and how best to tell it. A strong visual identity for the project and a series of graphics to represent core findings were critical components for building awareness of the work and explaining complex ideas that might otherwise be lost in cultural translation. The body of work that the research team produced was packaged into a compelling story from which a presentation, printed brochure and one-sheet were produced. These materials have made the research and resulting strategy accessible to a large number of people that would not otherwise be exposed to or understand the lengthy report. The research team is able to share their recommendations in a universal format with multiple audiences who have different cultural perspectives. A visual articulation of the strategy has made core concepts tangible and enabled the research team to gain support for the implementation of their plan. For the last several years, the Africa Tourism Strategy team has continued to promote its work and publish updated recommendations and findings as the project evolves. As part of a promotional campaign for AFTFP Tourism's recently released book entitled "Tourism in Africa: Harnessing Tourism for Growth and Improved Livelihoods," we created an informational booklet and one-pager which was shared at the United Nations World Tourism Organization's 2013 General Assembly. Energia Eficiente (EE) is a consulting firm focused on helping entrepreneurs invest in energy efficiency through a unique combination of technical and financial assistance. The company runs Programa Pro Hoteis (PPH), an initiative aimed at helping the Brazil hotel industry implement energy efficiency measures. When Energia Eficiente took over PPH — which had received start-up funding from the International Finance Corporation (IFC) — the program was successful at completing energy-efficiency audits, but struggled to convince hotels to implement the recommendations outlined in the audits. Energia Eficiente had the technical and business skills to take the program to the next level, but it lacked marketing expertise. That’s when a member of the leadership team reached out to Blue Marble for assistance with developing the marketing strategy. Blue Marble conducted an in-person BluePrinting workshop at our White Salmon, Washington office with one of the EE leaders. We spent nearly three days combing through presentation materials, visualizing the future, and discussing audience objections. We brought clarity to Energia Eficiente’s sales and consultation process. We helped EE’s leadership team get clear on the perspective of their ideal hotel customer through each stage of the process, and documented our conclusions with a customer journey map. We also created audience profiles, and a mood board which provided direction for a new brand and aesthetic, and we outlined the messages for a new sales presentation. As a last step in this process, we executed a redesign of both Energia Eficiente's visual identity as well as that of Programa Pro Hoteis. Energia Eficiente’s new materials contain icons and illustrations that are used across the sales, auditing, and reporting process which serve to clarify and unify key messages about the PPH offering. Energia Eficiente has a new sales presentation that has greatly improved the sales team ability to explain the program to potential participants. Energia Eficiente staff now has a comprehensive set of marketing tools, templates, and brand guidelines which they are easily able to update and expand upon. With clarity about how to explain the PPH program, Energia Eficiente is experiencing greater ease in their communications and confidence in their business development efforts. Its leadership team has a map showing where the team can make incremental changes to improve its customers’ experiences over time. After training in how to use their collateral, members of Energia Eficiente’s leadership team have been able to update presentations and sales materials on an ongoing basis. 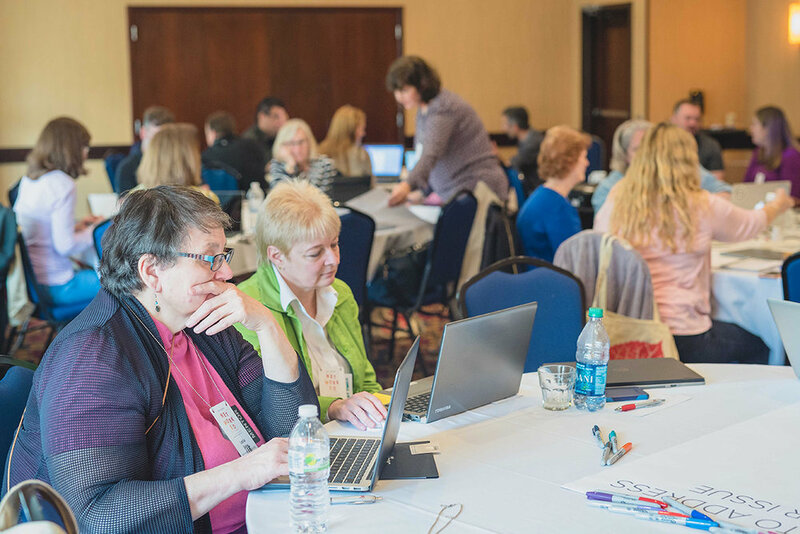 State Education Technology Directors Association (SETDA) is a national nonprofit helping build and increase the capacity of state and national leaders to improve education through technology policy and practice. When we first began working with SETDA, the organization had recently completed a strategic planning process that included a brand identity refresh. Yet SETDA’s website remained outdated, and was a poor example of the organization’s technical focus and innovation — a concept that is core to SETDA’s mission. The site’s content was poorly organized, the messaging lacked clarity, and staff could not easily make updates. In addition, SETDA project initiatives that warranted individual websites were not integrated into the parent website, creating an information gap and disjointed user experience. As important as having a clean, modern website and content management system (CMS) was having a seamless interface between SETDA’s parent website and its microsites. All of these interconnected websites needed to have a consistent look and one CMS. By using a WordPress multi-site install, we were able to establish a single database from which all sites originate and that allows for a multi-faceted search across all SETDA websites. The SETDA team had long been frustrated with the disorganization of their website content and their inability to efficiently manage it so it was critical for us to create custom modules in the CMS that would reduce staff members' level of effort. In the absence of compelling photography, the new website leverages typographic contrast, a bold color scheme, and strategic use of white space to denote information hierarchy, improve readability, and allow for easy navigation. Numerous customized editors in the CMS give SETDA staff a high level of control over their content and makes website administration much more streamlined than ever before. A powerful search allows users to search SETDA’s parent website and its microsites at once, and delivers comprehensive results. Since the launch of the parent website, Blue Marble has developed additional microsites that operate independently but share important database and stylistic features that bring cohesion to front- and back-end user experience. Founded in 2000 as Evergreen Consulting Associates, Evergreen Education Group underwent a major change in 2009 when the founder decided to transition away from environmental consulting and focus exclusively on the education technology (edtech) sector. This shift required a new company name, a new brand identity, and new communication tools such as a website and business stationery. As long-time partners, the company reached out to Blue Marble for help. Our approach to Evergreen’s rebrand centered around market research and personal interviews with the company’s staff and key clients so we could understand current perceptions and the distance between those and the ultimate vision for the business. Through this research, we discovered that Evergreen should capitalize its ability to maintain neutrality in its work (impartiality is highly valued when working with private, governmental and nonprofit entities in education) and create a timeless image that would resonate with an ever-evolving audience. We helped Evergreen see the value of keeping its current name whose meaning was multifaceted, and evolved the wording slightly to allow for growth and clarification of their specialization. The company’s new identity has supported Evergreen’s thought leadership and new business development. A suite of print and digital materials has helped Evergreen convey its story to gain recognition as a well-established, highly-valued research and consultant in the K-12 edtech space. Since its rebrand, Evergreen has grown into a mid-sized company that utilizes a carefully crafted network of consultants and partners to fulfill its mission. The company is reputed as a leading edtech research and consulting firm. As the company’s service offerings have evolved, Blue Marble has helped Evergreen define and explain its value proposition to potential clients — through brochures, presentations, and other marketing materials.